NEW DELHI: China has scored a major victory in soft power diplomacy by quietly launching its own Nalanda University while the original Nalanda campus in Bihar, planned almost a decade ago, is still stuck with 455-acre dead space. China’s education ministry had managed to keep the plan a secret till a few weeks ago when it formally announced the enrolment for Nanhai Buddhist College in Hainan province in May. The first batch is set to take off from September with a strength of 220 students to occupy the vacant Buddhist diplomacy space. Nalanda in 2014 had started with just 14 students and 11 teachers. Sources said the secrecy is baffling since China was part of the global team, which first promoted the idea of reconstructing Nalanda University in the ancient Indian city in 2006. Nalanda was hit by the careless approach of its mentors, including Nobel laureate Amartya Sen and his team, since the beginning of 2007 when the Manmohan Singh government appointed them to work out the plan for the institution. “In 2011, China had given a million-dollar cheque as donation for reconstruction of Nalanda. It appears now that Chinese were working in parallel to create the Buddhist university. Such sprawling campus cannot be built in one or two years. They must have started construction in 2012,” sources said. 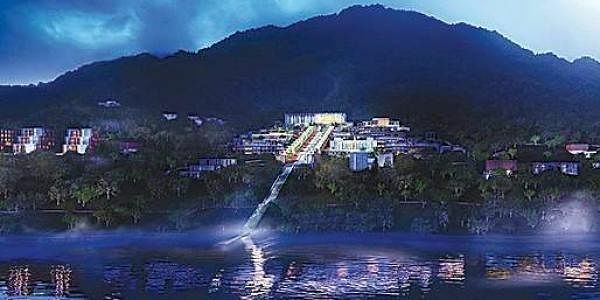 The Chinese Nalanda version is a sea-facing structure located on scenic Nanshan Mountains spread across 618.8 acres. Chinese have rechristened the university’s coastline as “Brahma Pure Land”, a concept borrowed from ‘Yoga Vashistha’ and Mahayana Buddhism. The Chinese Nalanda will offer courses in three languages—Pali, Tibetan and Chinese in six departments—Buddhism, Tibetan Buddhism, and the Buddhist Architectural Design and Research Institute. The Chinese Buddhist university is closely linked to the Buddhist centres in Thailand, Sri Lanka, Nepal and Cambodia, which is seen as an attempt to completely sideline the Indian side in soft power diplomacy. The China has appointed monk Yin Shun as the dean of the university, who is interestingly abbot of Lumbini-based Zhong Hua Buddhist temple. Lumbini is the birthplace of Buddha, and China has been aggressively pushing to promote Nepalese pilgrimage site to counter India’s Sarnath and Bodhgaya, where Gautama Buddha is said to have attained enlightenment. Since early 2010, Yin Shun has been advocating “the South China Sea Strategy” and had closely worked with Thailand and Nepal to create Buddhist ‘One Belt and One Road’ (OBOR). It is a known fact that India recently boycotted China’s high-profile economic design flagging sovereignty concerns over China-Pakistan Economic Corridor (CPEC), which passes through Pakistan-occupied Kashmir (PoK). The plan, according to sources, is to link Lumbini, Wuxi and Hainan through Buddhist OBOR, usurping Buddhist legacy of India. Wuxi, near Shanghai, has been turned into permanent venue of world Buddhist forum by the Chinese government. According to sources, students as far as South American countries are applying to the Chinese university, which, along with knowledge, promises to provide best air and seawater quality in entire South Asia.